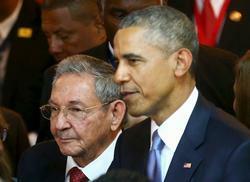 Equipo Nizkor - Obama and Raúl Castro in historic meeting at Summit of Americas. The leaders of the US and Cuba held their first formal meeting in more than half a century on Saturday, clearing the way for a normalisation of relations that had seemed unthinkable to both Cubans and Americans for generations. In a small conference room in a Panama City convention centre, President Barack Obama and Cuban president Raúl Castro sat side by side in a bid to inject fresh momentum into their months-old effort to restore diplomatic ties. "And more importantly, with Cuban people." Castro told the US president he was ready discuss sensitive issues including human rights and freedom of the press, saying: "Everything can be on the table." But he also cautioned that the two countries have "agreed to disagree". The remarkable gathering played out on the sidelines of the Summit of the Americas, which this year included Cuba for the first time. Although the meeting was not publicly announced in advance, White House aides had suggested the two leaders were looking for an opportunity to meet while in Panama and to discuss the ongoing efforts to open embassies in Havana and Washington, among other issues. In brief remarks to reporters at the start of the meeting, Obama acknowledged that Cuba, too, would continue raising concerns about US policies. Earlier in the day, Castro launched into an exhaustive history of perceived Cuban grievances against the US in his speech to fellow leaders attending the summit. In a meandering, nearly hour-long speech to the Summit of the Americas, Castro ran through an exhaustive history of perceived Cuban grievances dating back more than a century - a vivid display of how raw passions remain over American attempts to undermine Cuba's government. Then, in an abrupt about-face, he apologised for letting his emotions get the best of him. He said many US presidents were at fault for that troubled history - but that Obama was not one of them. "I have told President Obama that I get very emotional talking about the revolution," Castro said through a translator, noting that Obama had not even been born when the US began sanctioning the island nation. "I apologise to him because President Obama had no responsibility for this." In a remarkable vote of confidence from a Cuban leader, Castro added: "In my opinion, President Obama is an honest man." Speaking just before Castro, Obama acknowledged that deep differences between their countries would persist. Yet he said he was not interested in getting bogged down in ideology, instead casting the thaw in relations as an opening to create "more opportunities and resources for the Cuban people". "The United States will not be imprisoned by the past," Obama said. "We're looking to the future." Raising the stakes even higher for the two leaders was mounting speculation that Obama would use the occasion of the summit taking place in Panama to announce his decision to remove Cuba from the US list of state sponsors of terrorism, a gesture that for Cuba holds both practical and symbolic value. The US long ago stopped accusing Cuba of conducting terrorism, and Obama has signaled that he is ready to take Cuba off the list. On Thursday, he suggested an announcement was imminent when he revealed that the State Department had completed its lengthy review of the designation. A successful relaunch of US-Cuba relations would form a cornerstone of Obama's foreign policy legacy. But it is an endeavor he cannot undertake alone: only Congress can fully lift the onerous US sanctions on Cuba. On Republican-controlled Capitol Hill, there are deep pockets of opposition to taking that step.